This is a scalable context timeline. It contains events related to the event September 10, 2001: Russian Air Force Begins Week-Long Exercise; Monitored by US Fighters. You can narrow or broaden the context of this timeline by adjusting the zoom level. The lower the scale, the more relevant the items on average will be, while the higher the scale, the less relevant the items, on average, will be. 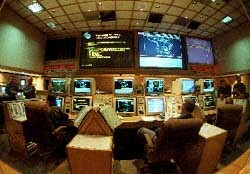 NORAD Fully Staffed and Alert - NORAD is currently running a real-world operation named Operation Northern Vigilance (see September 9, 2001). It may also be conducting a field training exercise calling Amalgam Warrior on this morning (see 9:28 a.m. September 11, 2001). NORAD is thus fully staffed and alert, and senior officers are manning stations throughout the US. The entire chain of command will be in place and ready when the first hijacking is reported. An article later says, “In retrospect, the exercise would prove to be a serendipitous enabler of a rapid military response to terrorist attacks on September 11.” [Aviation Week and Space Technology, 6/3/2002; Bergen Record, 12/5/2003] Colonel Robert Marr, in charge of NEADS, will say: “We had the fighters with a little more gas on board. A few more weapons on board.” [ABC News, 9/11/2002] However, Deskins and other NORAD officials later are initially confused about whether the 9/11 attacks are real or part of the exercise (see (8:38 a.m.-8:43 a.m.) September 11, 2001). In response to the terrorist attacks in the United States, the Russian military cancels a major training exercise it has been holding, turning back its bomber aircraft and calling off planned missile testing. [Toronto Star, 12/9/2001; Defense Video and Imagery Distribution System, 9/8/2011] The Russian Air Force began the exercise—which was being conducted over the North Atlantic, Pacific, and Arctic Oceans—on September 10 (see September 10, 2001), and had planned for it to continue until September 14. NORAD has deployed fighter jets to Alaska and Northern Canada to monitor the exercise (see September 9, 2001).